Saturated fats are the main dietary cause of artery-clogging LDL cholesterol (the bad stuff). When discussing different oils used in cooking, we often keep our attention on whether or not the oil has much saturated fat. Saturated fat is great for making the durable crispy coating on deep fried food – it holds up in high heat and can be used again and again. Edible oils may come in liquid or solid state, but not all edible oil is created equal. The calories, however, are just about equal – 120 per tablespoon, regardless of the variety of oil; but the benefits and dangers can vary widely. Some vegetable oils including coconut oil, palm oil and palm kernel oil come from nature loaded with saturated fat. Some oils do not start out saturated, but processors bubble hydrogen gas through them to make them saturated. Other oils, in particular extra virgin olive oil (EVOO) are made up of mostly monounsaturated fats (that just means that there is one position on the fatty acid chain that doesn’t have a hydrogen stuck on it). In addition, to getting us away from artery-clogging saturated fats, there are some very important health-promoting compounds in EVOO that may help us make a decision for an oil change. I should note here that most people get their palm, palm kernel and coconut oils in processed foods. These oils are relatively cheap and are so saturated that they can be used at very high temperatures without degrading. Think: French Fries! Many decades ago when I was first studying nutrition, I began to read that olive oil was a healthy choice. But I was not used to the taste of the olive oils I tried, so I kept using canola oil. Then about 10 years ago I discovered that there are very mild varieties of extra virgin olive oil; that motivated me to make an oil change. At first it only benefited Vic and me; except for the birthday cakes that I made at that time for the grandchildren. I used a box cake and my mild-tasting extra virgin olive oil. Every one said that they loved them and I never made a huge deal about the oil. Looking back, those cakes were almost an oxymoron in their nutritional profile – 99% white flour and sugar, made with extra virgin olive oil. Since those days, I’ve stopped making my oxymoronic trinket cakes; so I no longer have to worry about being a purveyor of sugar and white flour. Why did I switch to extra virgin olive oil? The answer is that it is so often related to health benefits. Olive oil has the highest amount of heart-protective monounsaturated fats and polyphenols (the antioxidants with anti-clotting and anti-inflammatory properties.) There’s another compound in extra virgin olive oil called oleocanthal; it seems to act similar to ibuprofen (relieve pain and has heart health benefits similar to taking a low-dose daily baby aspirin.) Please note, I am avoiding the pitfalls of nutritionism by mentioning several members of the team and by promoting EVOO as a whole food, not recommending extracted ingredients. In the beginning, olive oil was studied quite a bit because it is a staple of the Mediterranean-style of eating. In Crete, where the heart health was excellent, cancer and diabetes rates were low and life expectancy was long – olive oil was the oil of choice. Modern science is just beginning to really figure out how EVOO does its magic. Researchers in a combined study between Spain and Tufts, in Boston don’t know if it’s only one of the phenolic compounds in EVOO or if the effects are a result of a synergic effect of the total phenolic ‘special team’ within the oil. What they are discovering is that genes previously linked to fighting obesity, high blood-fat levels, type 2 diabetes and heart disease are turned on more (expressed) when EVOO is eaten. The researchers learned that EVOO not only made genetic changes that reduced coronary heart disease and tumor growth, but in addition, it slowed down harmful lipid and DNA oxidation, reduced diabetes-connected insulin resistance, inflammation, and carcinogenesis. A second research group in Spain spent over twenty years working to determine the effects that EVOO has in protecting the body against breast cancer. This group has discovered a decrease in the activity of genes that control the proliferation and growth of breast tumors. A third study published in the Federation of American Societies for Experimental Biology (FASEB), July 6, 2010 was commented on by the Editor-in-Chief of the FASEB Journal, Gerald Weissmann, M.D. He said; “This study is ground breaking because it shows that olive oil and a Mediterranean diet affect our bodies in a far more significant way than previously believed.” He went on to say that the research offers more support for encouraging people to change their eating habits. I use extra virgin olive oil for all my cooking – it works perfectly for me. One reason it works for me is that I don’t do any deep-frying. The problem with EVOO is that it has a smoke point of about 385 to 420 degrees Fahrenheit – which essentially means that it will start smoking if you get it too hot. This is why the much cheaper coconut oil, for example, loaded with saturated fat, works better for deep-frying. “Extra virgin” means that the oils comes from the first cold pressing of the olives, This just means that the producers of the EVOO did not use heat to extract the oil and the resulting oil is from the first round of pressing the olives. That’s important because it retains more of the antioxidants and other healthy components that are being shown to be so generally health-promoting in both the newer and older studies. Buy your olive oil in a dark colored bottle or can, so light can’t turn it rancid. Keep it sealed and away from oxygen and heat. If you want to do deep-fry cooking, peanut oil has a much higher smoke point without as much saturated fat as found in coconut oil, palm oil, and palm kernel oil. These studies seem to point to the olive oil itself as the health agent, but some studies have said that the EVOO may interact with other foods that are common in the Mediterranean diet. It may be an interaction that results in the health benefits. My guess is that other nutrients in the fruit, vegetables, whole grains, legumes, and nuts are indeed involved in keeping the Mediterranean people healthy. Like my metaphor from the last post of the entire team acting together (instead of foolish nutritionism singling out a single player), I believe there are indeed unknown interactions between EVOO acting in teamwork with other foods. Great chefs have long waxed poetic about the marriage of flavors, textures, and tastes that make a great meal. This form of passionate poetry about great food can now be extended down to the marriage of the molecules between the oil and the perfectly cooked veggies that together create healthy life. Even though EVOO appears to have real health benefits, one thing it shares with those other less healthy oils is 120 calories per tablespoon. That adds up easily; a fourth cup is a fairly small measure, but delivers just under 500 calories. If you measure your oil with a tablespoon, you will be less likely to let excess calories hit your waistline. The take away lesson is: when you use oil – make it EVOO, but use it in moderation. Don’t wait as long as I did; get an oil change today! 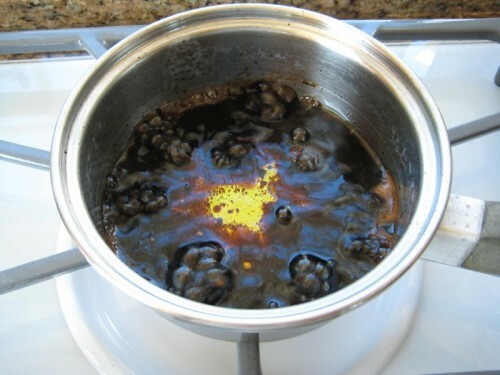 Reduce balsamic vinegar by cooking on the stovetop for 10 or 15 minutes. 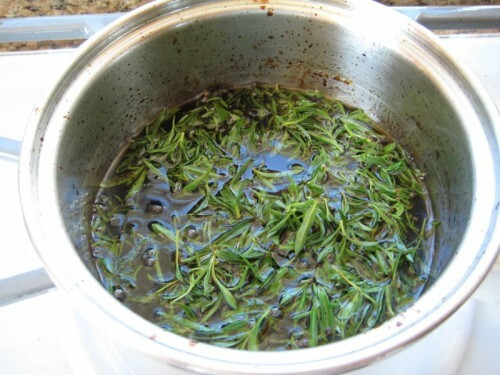 Mix in oil and add rosemary. 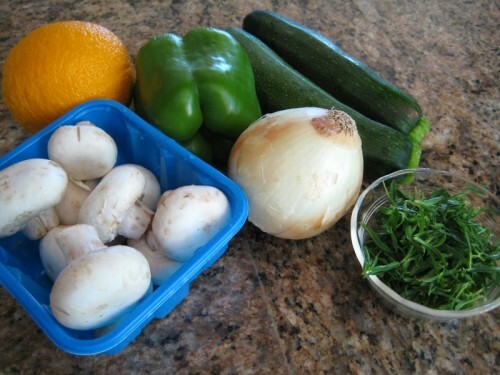 Cook chicken in covered microwave dish; remove skin and bones. 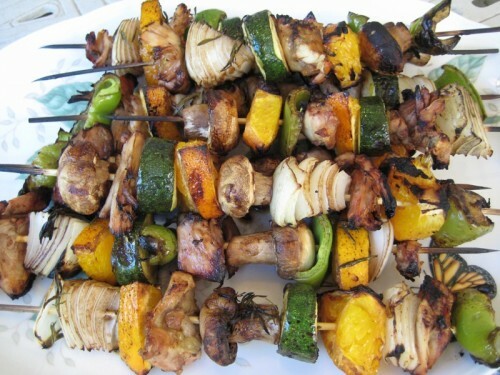 Skewer chunks of fruit, vegetables and chicken. Brush with balsamic, oil and rosemary mixture. 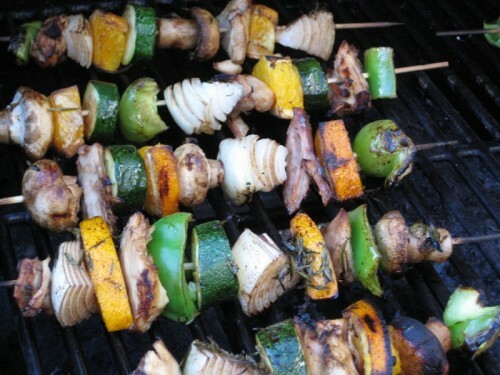 Grill until vegetables are tender. 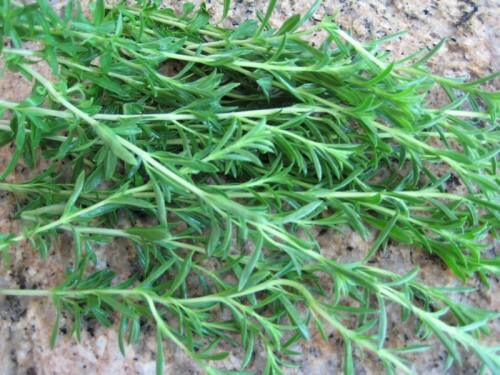 Remove the heavy stems from the rosemary. Add the rosemary to the EVOO and vinegar. 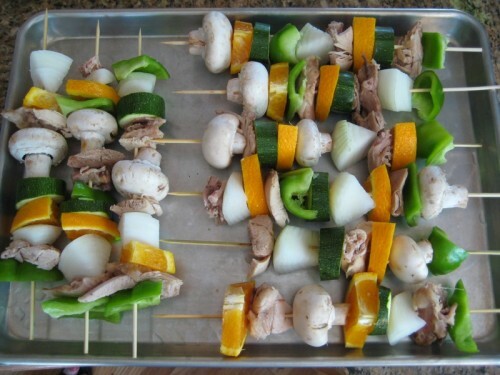 Skewer the chicken, orange and vegetables. 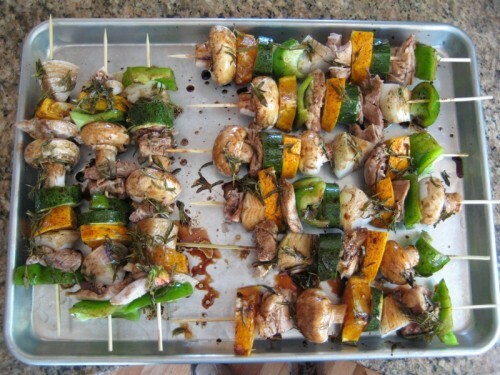 Baste the skewers with the rosemary mixture. 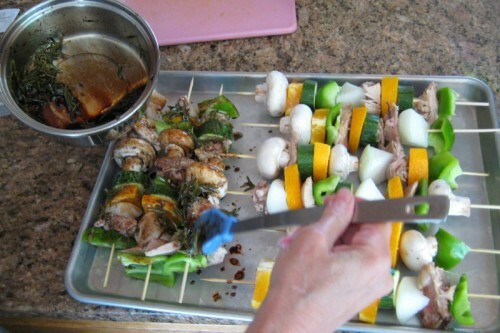 Grill until the veggies are tender. Serve your colorful, tasty low-fat Mediterranean meal. Is ‘Mediterranean Burger’ an Oxymoron?